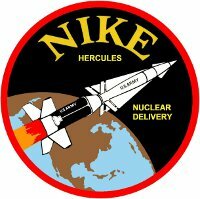 The Nike Historical Society, a 501(c)(3) tax-exempt organization, was founded to preserve in history the critical role Nike Missile Systems played in the air defense of our nation and other nations throughout the free world. The primary focus of the Society is to provide technical assistance and support to organizations for restoration projects and/or historical legends. 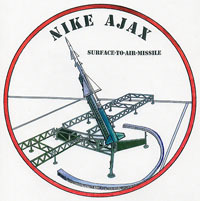 The Society also insures that accurate and proper interpretations of the Nike Missile System are adhered to. In addition, the Society, through the site historian, is available to answer questions pertaining to the Nike system. 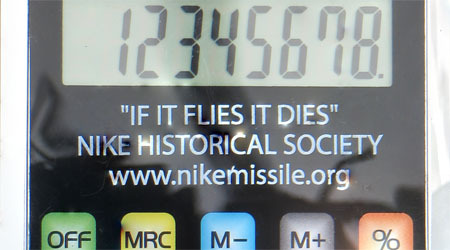 All profits that the Nike Historical Society makes from sales through the online store will be spent to further the goals (stated above) of the Society. Take a part in saving history. The Nike Historical Society is a group of Nike veterans and enthusiasts who are striving to keep the memory of the Nike program alive. Our objective is to support the restoration of Nike sites throughout the United States, to insure that interpretation of these sites is accurate, and to assist with technical information. 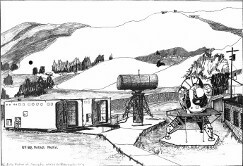 In addition, we are here to answer questions about the Nike missile system and the role it played in the defense of our nation and our allies during the Cold War. Though the society was conceived and implemented by Nike Veterans, anyone interested in furthering its aims may become a member. New memberships are $25 for the first year. All renewing memberships are $20 per year. 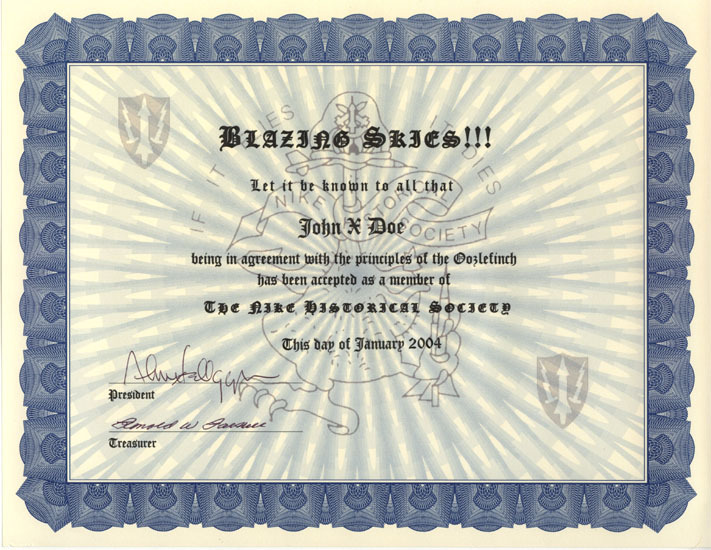 The additional $5 for new members pays for the societies expense for shipping items to new members. 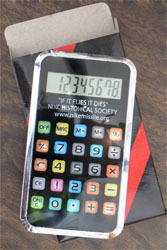 Membership fees, except the additional $5 for new members, are tax deductible. You are not limited to a one year membership, whether you are a new member or are renewing. You can sign up or renew for as many years as you want. The amount is $20 per year. 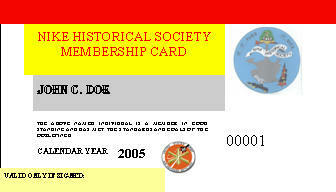 The society also offers a lifetime membership for $250. 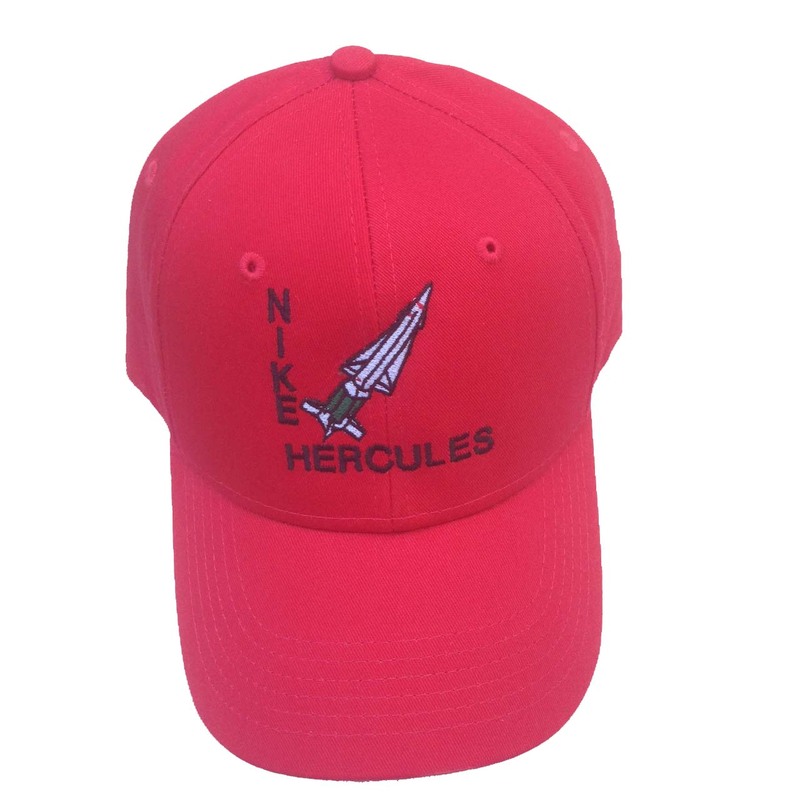 Wear one of these distinctive Nike missile hats, a great way for Nike Missilemen to honor their service. Great also for historians and others with an interest in the Nike system. These bold red hats are sure to get a second look. 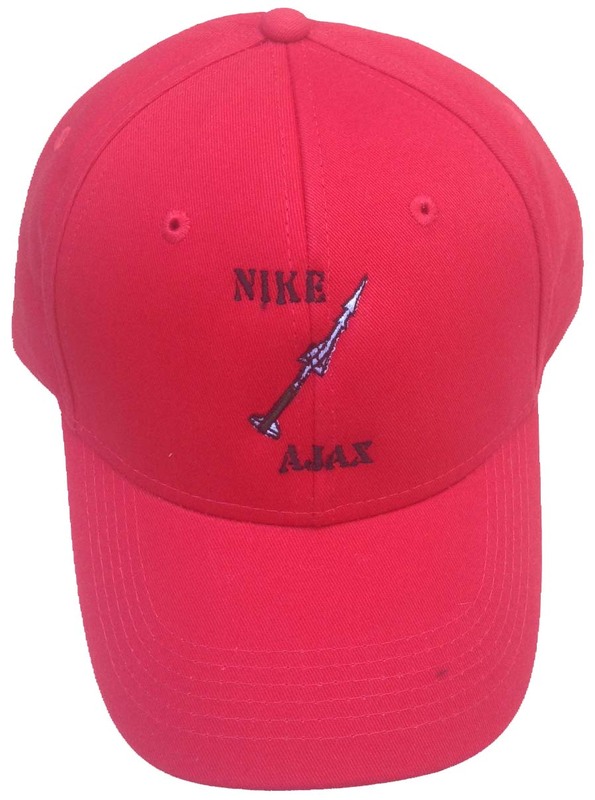 Designed for the Nike Historical Society by Al Kellogg, these limited edition Nike missile hats sell at $19.95 each plus a shipping and handling charge of $6.00 per order. 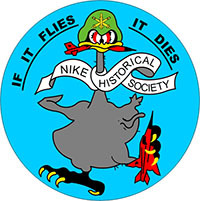 We send a 4 inch Nike Historical Society decal to new members. It is a quality decal which is guaranteed not to fade for two years. It now costs us $4.50 per decal. Any current member who would like a decal may receive one for $5.00. The extra $0.50 is to defray the cost of a mailer and postage. This 4 inch diameter decal is adhesive backed and adheres to smooth, clean surfaces such as glass. How many times have you tried to picture something from your youth? Sometimes a picture forms when you smell a familiar smell or hear a familiar tune on the radio. What brings back the memory? Don't you sometimes just wish you had those pictures always at the ready whenever you want to see them in your minds eye? I know most of us wish we could, especially those of us that served in the Army Air Defense Command. Now you can get something to show your friends and family. 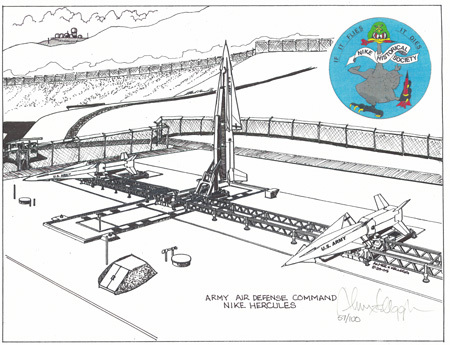 Al Kellogg, a Nike Hercules VET who served at C Battery, 2nd of the 51st Arty, San Rafael, California is offering two prints of his pen and ink work. These prints are the beginning of a series of prints depicting the Nike story. 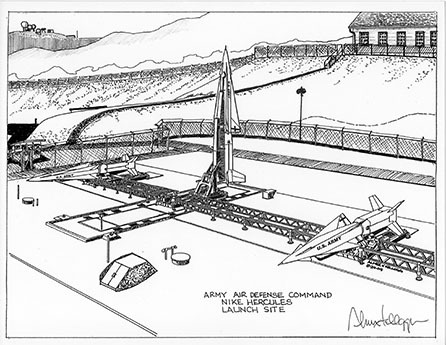 The first of the series depicts a Nike Hercules Launching Area, with the IFC in the background. The second in this series is a wonderful assemblage of an IFC. These 8.5" by 11" pen and inks would be great for your wall or desk. Get your memory back as soon as you can. As you know, if you can remember, we were not allowed to take pictures or make drawings of our sites when we were there. You can have your very own NOW. These wonderful pen and inks are popular, so get yours now. You can purchase a signed unframed copy of this print for only $25. We have located a dozen signed and numbered copies bearing our Oozlefinch logo and are selling these for $30. 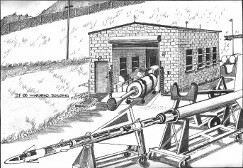 We've found a few unsold signed and numbered prints, with the NHS Oozlefinch Logo, of the launcher area. 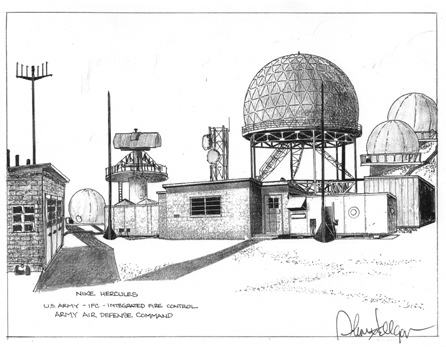 IFC, Launcher Area, SF-88 museum Radar Park, and Warhead Building are also available as postcards (4x6 inch) at $1.25 each ($5.00 for a set of the 4 postcards). Show your support for the Nike Historical Society and the Nike story by wearing our high quality metal and enamel Nike Historical Society Lapel Pin. This 3/4 inch diameter pin is $8.95. 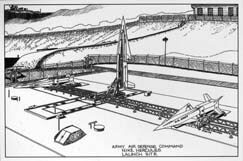 Paying for your selection: The Nike Missile Store is staffed by volunteers. Because of the small number of customers we have, we are able to treat each customer as a valued individual. You can mail your payment to us, or you can use your credit card or PayPal to make your payment. Either way, please be sure we know what you are paying for. If you are joining as a new member or renewing a membership, please be sure we have your name, address, and email address. If you are buying an item, please be sure we know what you are buying, the quantity you want, and your shipping address and contact information such as mail and email addresses and phone number. The Nike Historical Society is an elite group. First and foremost, we are in this to promote appreciation of the Nike Missile System and those who made it work. We who mind the store are trying to keep this simple for ourselves and everyone else.